She took a bus into Reykjavík, the number 1 bus, that afternoon, and wandered around the city. 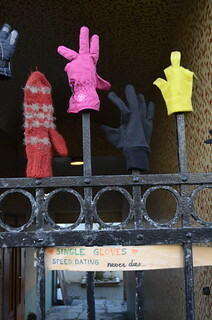 She found gloves lined up on railings with a sign saying "Single gloves speed dating", and she wondered how her glove that she had lost in Vík was doing. She went past a postbox for "letters to the Icelandic Santa" and it explained that you should write a letter with the name of your best friend or child and they would get a letter and gift from one of the 13 Icelandic yule lads. She walked past souvenir shops selling many toy puffins, and a shop with a large polar bear outside. 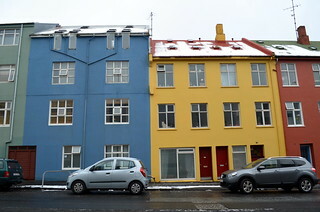 It was snowing on and off in Reykjavík that day. 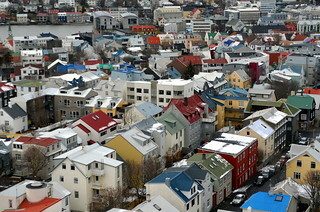 She took a lift to the top of the Hallgrímskirkja and admired the views across the city of the colourful buildings. She went inside the Harpa building and stared up at the geometric shapes and the pretend birds flying across. She found a glowing sculpture made out of empty bottles. Then she stood for a while by the harbour, simply looking out across the water to the mountains, the beautiful mountains. I like that the gloves are all middle-finger upright. I would almost certainly have left the city with several puffin-related souvenirs even though I'm usually wholly souvenir-resistant.